Need a good laugh? Well your in luck! 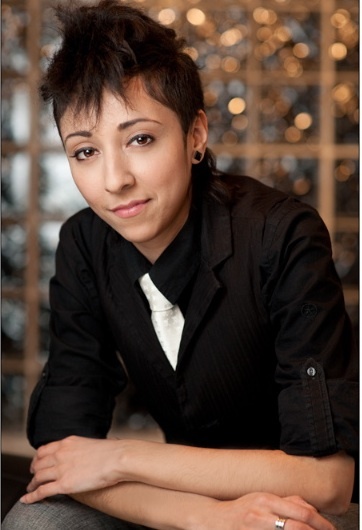 This month we are tickled to have comedian Gwen La Roka as our Proyecto Latina feature. Some of you might remember her memorable performance in Teatro Luna’s production of Machos a few years back. Since then she has been on the move performing her comedy at universities and comedy clubs. Gwen La Roka has just recently grabbed a hold of the microphone, but since then she has managed to take the comedy scene by storm. A Jacqueline of all trades, Gwen’s grasp on acting and theatre has helped her seamlessly combine these talents and others to keep crowds laughing with her highly energetic comedy routine. Gwen holds nothing back while entertaining crowds with stories about her life as a Latina to living as a skinny girl in the Windy City. Gwen’s commitment to grassroots activism and social justice has inspired her to keep crowds laughing while giving a voice to many often marginalized communities. Similarly, Gwen finds audiences enjoy her often quirky, real, yet clean viewpoint on touchy topics such as body image, sexual identity and her scoliosis diagnoses. Skilled in the arts of break-dancing, emceeing, writing,and spoken-word; Gwen aims to soon bring those elements of her personal life into her routines as well. In 2010, Gwen claimed 1st place in Mikey O’s Annual “Last Loco Standing” comedy competition, making her the first female Last LOCA Standing to win the title. Gwen was also featured on The Queer Queens of Qomedy at Zanies in Chicago, sharing the stage with widely known Poppy Champlin (Pride: The Gay & Lesbian Comedy Slam, Logo) Sandra Valls (The Original Latin Divas of Comedy, Pride: The Gay & Lesbian Comedy Slam) and Vicky Shaw. Additionally, she has shared the stage with some of comedy’s most loved andrespected comics such as Rudy Moreno (NBC, Lopez Tonight Show), Patti Vasquez (TBS), Alex Ortiz (BET), Carmen Lynch (Comedy Central, NBC), Joey Villagomez (HBO Latino), and Shayla Rivera (Comedy Central). Gwen also appeared as one of Chicago’s 2010 and 2011 “Las Comadres of Comedy”, alongside Ana Belaval (WGN News) & Patti Vasquez. Gwen’s honest comedic approach, meshed with her physical humor, enables her to bring together diverse crowds from all ethnic backgrounds in solidarity, while reminding us that we are all one in the same, here to live life with a little laughter in our hearts.